Now that I live in Georgia (which is the peach state), I kinda feel like it wouldn’t be right to ignore national peaches and cream day. 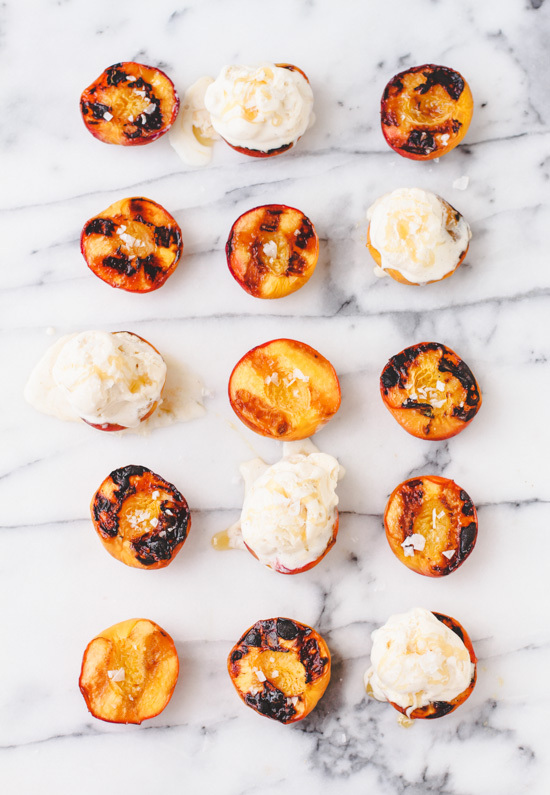 So, I have a quick grilled peaches recipe for you that you should totally try this weekend. We made a bunch of these yesterday, and will be eating them all day everyday until they’re gone. No complaints here. So good! Clean grill grates. Brush them with canola oil and preheat on a low to medium heat. Sprinkle sugar on top of each half of the peach to your liking and place them on the grill for 10 minutes (cut side facing up). 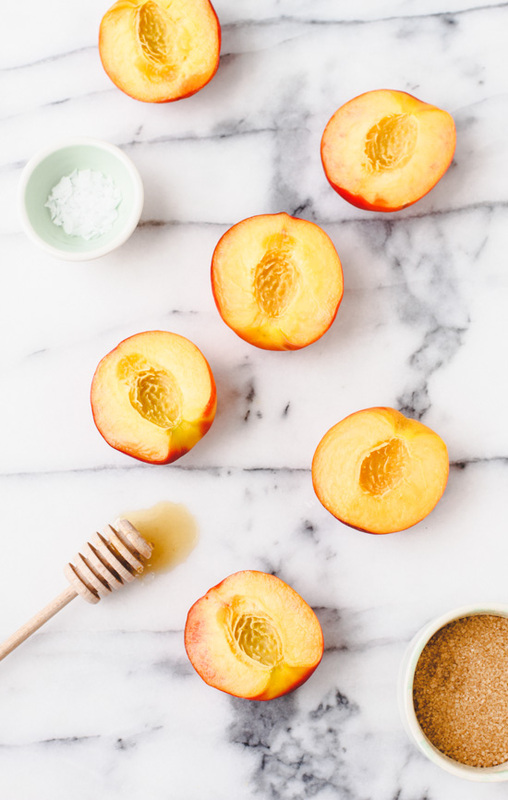 Then, flip the peaches over so the cut side is facing down onto the grill for 15-20 minutes (or until the desired caramelization is achieved – if you want the peaches more towards the firm side, you’ll want to cook them for less time). 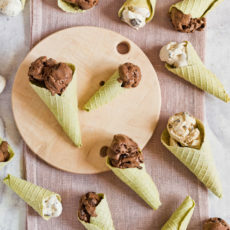 This recipe is perfect for summer…somewhere between decadent and healthy. Which sounds like a pretty good place to be, if you ask me. That little bit of salt tastes so good with the sweetness of the peach and ice cream. But if you’re looking for more ways to change up the flavor, I have a few ideas… Add a tiny pinch of ginger for a little bit of added kick. Or cinnamon to punch up the sweetness. This would be really good with grilled pineapple too. Which I’m bound to try eventually. 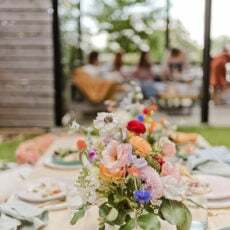 What are your favorite summer dessert recipes? Do you do a lot of fruit based desserts during the summer? P.S. 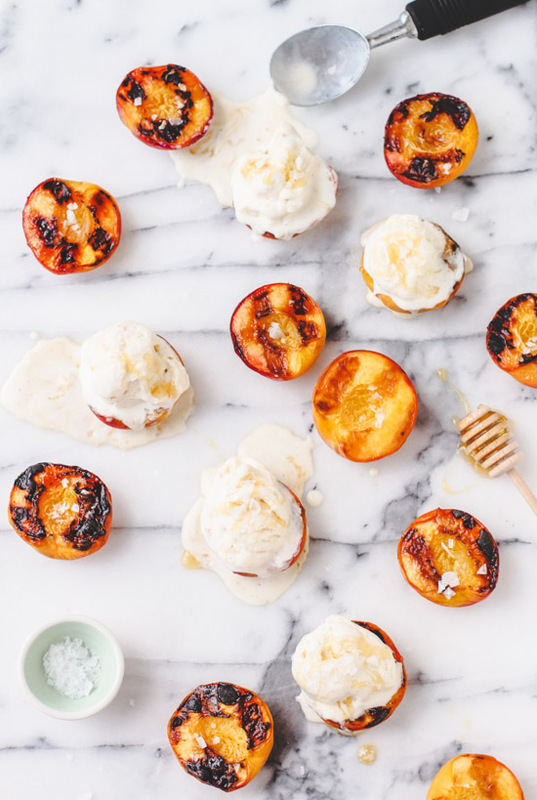 If you want to make your own homemade vanilla ice cream for these grilled peaches, use this recipe. Just leave out the waffle pieces and maple syrup and you’re good to go. These pictures are making my mouth water! I love grilling peaches during the summer! Thanks Megan. I’m super into grilling all kinds of fruits right now. My assistant, Linda, is the one who got me into it and now I can’t stop. So good (and easy too). Ah these look delicious! I always mean to try grilled peaches but always forget when the BBQ is out. 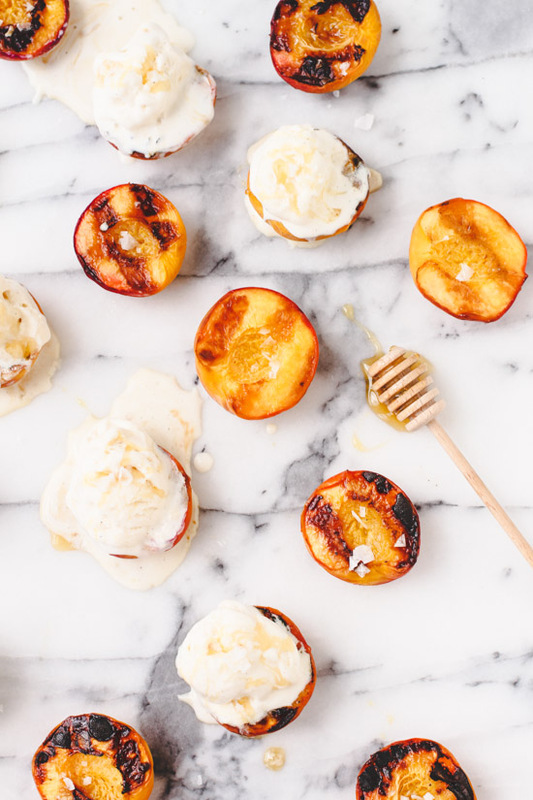 I’ve also seen a recipe for grilled peaches with balsamic vinegar and honey which I think would go well with ice cream too. Oh, balsamic vinegar and honey sounds like an awesome combination too, Kelsey. I will definitely have to try that. Right, Georgia? Perfect for Atlanta. Yumm! 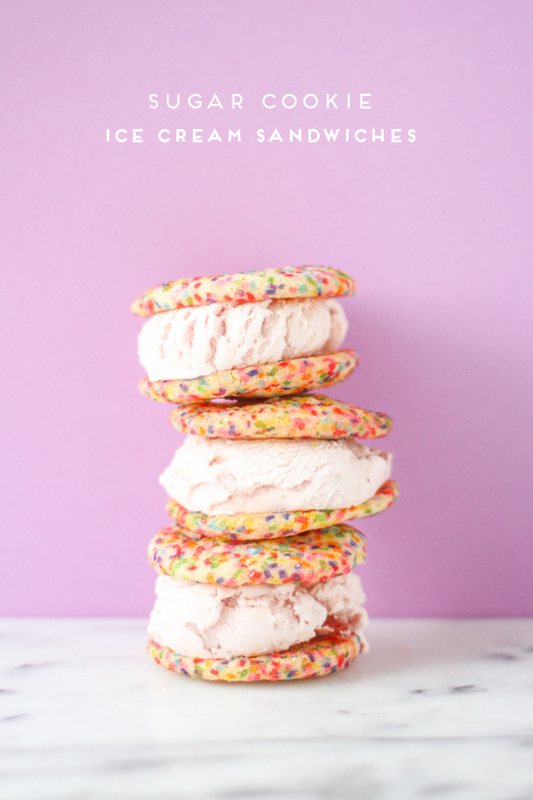 The pictures have my mouth watering… I have to make these soon. YUM! 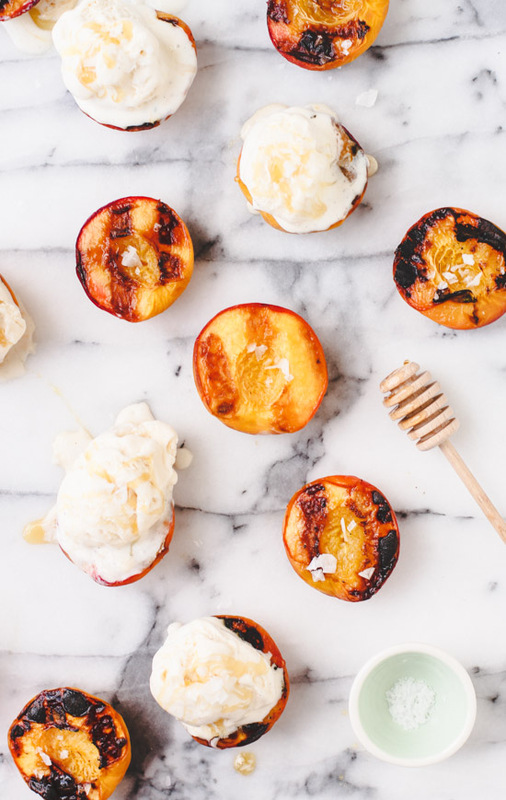 We happen to have peaches in our fridge right now, so we’ll be having this for dessert tonight! this looks amazing!!! Lovely photography too! Looks delicious! I’ve tried grilled pineapples with ice cream already, maybe now it’s time for peaches. Fruits and ice cream are such a great combination for summer. OMG this looks like heaven in your mouth!!! 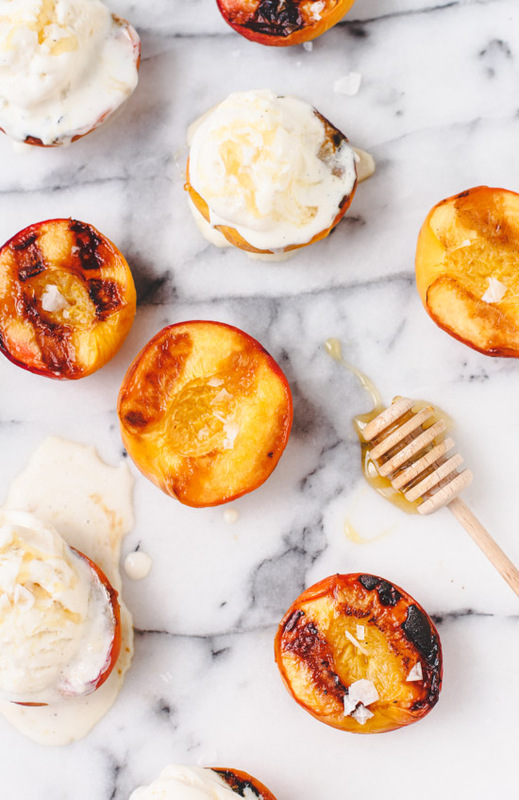 I love peaches and with ice cream!? Too good! This sounds so good! Grilled peaches are the best!! Can’t wait for them to be in season!